Who is your client? What are its media goals? Amy Farrell: Sylantro Systems provides the leading Multiplay Application Feature Server technology, which enables rich, hosted IP communication services across fixed, mobile, and cable networks. [Its] media goals are to raise awareness and position the company as a thought leader in this space. So we decided on a campaign aimed at key trades that was centered on... CEO Marco Limena. What made FierceVoIP such a good hit for the company? How did you pitch the editors there? Farrell: FierceVoIP is among the top three trade publications covering Voice over Internet Protocol (VoIP), which made it a great target. 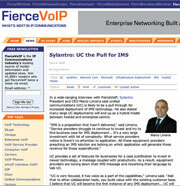 FierceVoIP editor Doug Mohney has followed Sylantro for several years, so we pitched him on the idea of speaking with [Limena] on the emerging topic of unified communications and how it might impact VoIP growth going forward. Did you media train Limena for this interview? What other information did you provide to help clinch this placement? Farrell: We did generate some message points, which we shared with [Limena] before he spoke with Mohney. We also provided [Limena's] extensive career background to Mohney, which gave [Limena] the chance to explain why he left a high-profile position [at HP] to join a relatively small company... and how he planned to move the company forward. What was the impact of the hit? Farrell: This interview not only resulted in the standalone feature profile story, but as a result of this briefing, Mohney also asked Sylantro to participate on a Unified Communications speaking panel at NXTcomm conference and invited [Limena] to keynote the event.